Description: This is a woody vine up to 20' long that can climb adjacent vegetation and other objects by its tendrils, otherwise it sprawls across the ground (3' high or less). Living woody stems are pale green, glabrous, and 4-angled or terete; dead stems become light to medium brown. Stout thorns up to 1/3" long (8 mm.) are scattered along many of the stems. 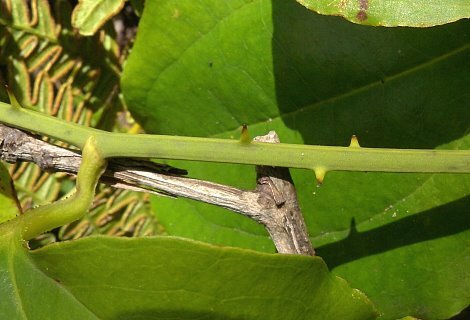 These thorns are somewhat broad at the base, flattened, and usually straight; they are also pale-colored with black tips. Some stems are thornless. Alternate leaves occur along the newer stems at fairly regular intervals. These leaves are 2-6" long and 2-5½" across; they are oval-ovate or broadly ovate with margins that are smooth (entire) and occasionally minutely prickly. The upper leaf surface is medium to dark green and glabrous, while the lower leaf surface is pale to medium green and glabrous (but never glaucous). Venation is parallel with 3-5 primary veins per leaf. Along the lower surface of these veins, minute prickles may be present. The petioles are ¼-½" long, pale green, and glabrous. At the base of each petiole, there is a pair of small sheaths that terminate in tendrils. Umbels of 3-20 flowers (about ½-2" across) are produced from the axils of leaves. Because Round-Leaved Greenbrier is dioecious, male (staminate) and female (pistillate) flowers are produced on different vines. Both male and female flowers are about ¼" long, each flower consisting of 6 yellowish green or green tepals that are joined together at the base. Male flowers have 6 stamens with white anthers, while female flowers have a greenish pistil with 3 short stigmata. The peduncle of each umbel is ½-¾" long, pale green, and glabrous. The blooming period occurs from late spring to early summer for about 2 weeks. Afterwards, fertile female flowers are replaced by berries that become blue-black with a whitish bloom at maturity (late summer or fall). There berries are about ¼" across and globoid in shape; each fleshy berry contains 1-3 seeds. The root system is shallow, fleshy, and fibrous. Cultivation: The preference is partial sun, moist to dry-mesic conditions, and a slightly acidic soil containing loam, clay-loam, rocky material, or sand. The seeds can remain dormant in the ground for several years; germination in the soil is enhanced by greater exposure to light. Range & Habitat: The native Round-Leaved Greenbrier is fairly common in southern Illinois, while in the central and northern sections of the state it is absent (see Distribution Map). Illinois lies along the NW range limit of this species. However, it occurs in sandy areas along southern Lake Michigan in both Indiana and Michigan. Habitats include bottomland woodlands, sandstone bluffs, bluffs along rivers, sandy wooded slopes, sandy savannas, Red Maple swamps, stabilized sand dunes along Lake Michigan, woodland borders, powerline clearances in wooded areas, and thickets. Round-Leaved Greenbrier is a pioneer species that favors hilly disturbed areas where the soil is often sandy or rocky. This woody vine is able to resprout from its root system in response to occasional wildfires. Faunal Associations: The insect visitors of the flowers are probably similar to those of Smilax hispida (Bristly Greenbrier) as they have very similar flowers. Thus, likely floral visitors of Round-Leaved Greenbrier include Halictid bees, Andrenid bees, cuckoo bees (Nomada spp. ), Syrphid flies, and other flies. The flowers offer nectar as a floral reward to such visitors; the male flowers also offer pollen. 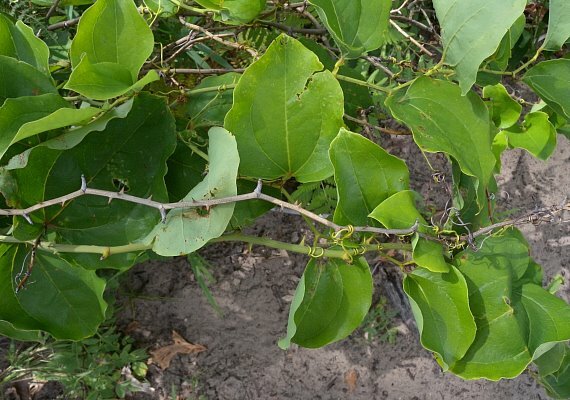 Other insects feed on the foliage of woody Smilax spp. (Greenbriers). These insect feeders include the leaf beetle Pachyonychus paradoxus, the aphid Neoprociphilus aceris, the thrips Ctenothrips bridwelli, and larvae of the following moths: Acrolepiopsis heppneri, Acrolepiopsis incertella, Phosphila miselioides (Spotted Phosphila), Phosphila turbulenta (Turbulent Phosphila), and Phyprosopus callitrichoides (Curve-Lined Owlet). Both upland gamebirds and fructivorous songbirds feed on the berries of Smilax spp. These bird species include the Ruffed Grouse, Red-Bellied Woodpecker, American Crow, Catbird, Brown Thrasher, Eastern Bluebird, and White-Throated Sparrow (see the Bird Table for a more complete listing of these species). Such mammals as the Opossum, Raccoon, Gray Squirrel, and Fox Squirrel also feed on the berries occasionally. Other mammals browse on the woody stems, leaves, and young shoots of these vines. This includes the Beaver, Cottontail Rabbit, and especially the White-Tailed Deer; it also includes cattle and other domesticated livestock. Round-Leaved Greenbrier and similar species provide protective cover for many birds and small mammals. Photographic Location: A wooded sand dune near Lake Michigan at the Indiana Dunes State Park in NW Indiana. 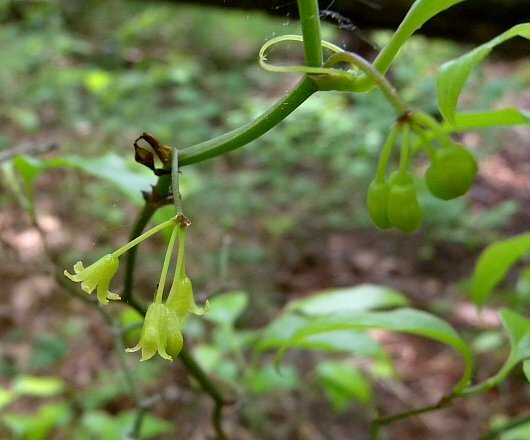 Comments: Round-Leaved Greenbrier is one of several woody Smilax spp. that can be found in southern Illinois. In the rest of the state, only Bristly Greenbrier (Smilax hispida) has been found. Round-Leaved Greenbrier can be distinguished from the latter species by the absence of bristly thorns on its lower stems, the shorter peduncles of its umbels, and the presence of fewer primary veins (typically 3, less often 5) on its leaves. Other woody Smilax spp. in southern Illinois have leaves with swollen basal lobes, some pubescence on the leaf undersides, or glaucous leaf undersides that are noticeably whitened. 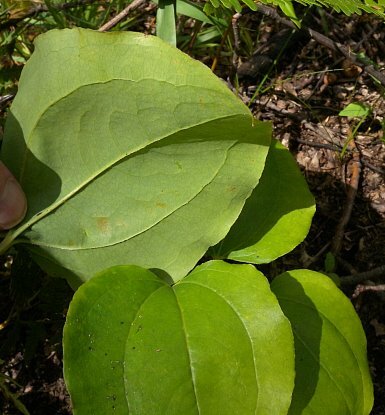 Other common names of Smilax rotundifolia are Common Greenbrier and Round-Leaved Catbrier.